I read this article and found it very interesting, thought it might be something for you. The article is called Foodgrain Output Up 5-Fold In 60 Years, Hides India’s Farm Distress and is located at https://archive.indiaspend.com/cover-story/foodgrain-output-up-5-fold-in-60-years-hides-indias-farm-distress-99910. India’s foodgrain production rose five times over six decades, according to 2016 government data, the latest available. But with the average Indian farm half as large as it used to be 50 years ago and yields among the lowest in developing economies, both the agriculture sector and farmers have been driven to the brink, shows an IndiaSpend analysis. Output of foodgrains in India increased from 50.82 million tonnes in 1950-51 to 252.22 million tonnes in 2015-16, according to the Agriculture Statistics At A Glance 2016 report. Yield increased as well, from 522 kg per hectare (ha) in 1950-51 to 2,056 kg/ha in 2015-16. Though it is the largest producer of pulses in the world, India’s pulses crop yield (659 kg/ha) was the lowest among BRICS countries in 2014. Cereal yield in India was the second lowest in the BRICS list, above Russia (2,444 kg/ha), according to Food and Agriculture Organisation’s 2014 data, the latest available. China reported the highest yield of cereals (5,888 kg/ha) and pulses (1,725 kg/ha) among BRICS nations. Source: Food and Agriculture Organisation of the United Nations; Note: Figures for 2014. The reason for the low yield is excessive dependence–52% of India’s farmland is not irrigated–on the annual monsoons, which climate change is making ever more erratic, IndiaSpend reported on June 8, 2017. “The preponderance of small and marginal holdings makes this high volatility even more worrisome, as small and marginal farmers are highly vulnerable to adverse climatic conditions,” said the State of Indian Agriculture 2015-16 report. Small and marginal farmers cannot afford to adopt modern techniques of irrigation and production. They also find it hard to use modern machinery on small plots. Stressed and burdened by indebtedness, successive crop failures and low yields, 4,659 farmers opted to end their lives in 2015, as IndiaSpend reported on January 2, 2017. The impact of these multiple problems is that the agriculture sector’s share in India’s economy is declining. It contributed 17.5% to the country’s gross value added (current price 2011-12 series) in 2015-16, down from 18.2% in 2012-13; 18.6% in 2013-14 and 18% in 2014-15. This is further expected to decline, as the data suggest. The contribution of the services sector is rising, from 50% in 2012-13 to 52.9% in 2015-16. 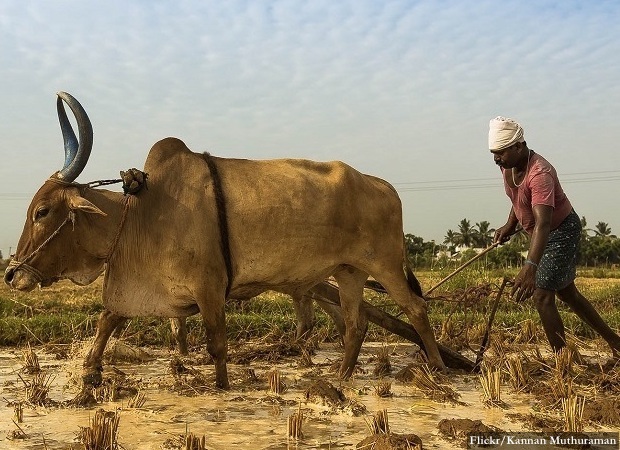 Why is India’s agriculture growth volatile? India’s agriculture growth rate has been volatile, from 1.5% in 2012-13 to 5.6% in 2013-14, -0.2% in 2014-15 to 0.7% in 2015-16. Source: Office of the Economic Adviser, Government of India; Note: PE – Provisional Estimate. The primary reason, as we discussed, is that more than half of India’s farms still depend on the monsoon, increasingly uncertain in an era of climate change. Climate change can impact crop yields, as well as the types of crops that can be grown in certain areas, by impacting agricultural inputs such as water for irrigation. Yields in rainfed areas remain low, underscoring the importance of irrigation in the country. Similarly, rising temperatures are likely to worsen yield fluctuations of many crops, the agriculture report said. Yield can be achieved by adopting non-conventional methods such as sprinkler, drip or micro-sprinkler irrigation, said the report. The size of the average farm holding in India declined from 2.28 hectares in 1970-71 to 1.15 hectares in 2010-11. These small and marginal land holdings comprise 85% of operational farms. Source: Agriculture Census 2010-11; Note: *Figures in hectares excluding Jharkhand. About 67% of agricultural land in India is held by marginal farmers with farm size less than one hectare, while farmers with large holdings–having more than 10 hectares–constitute less than 1%. The area operated by marginal farmers is less compared to their holdings but large farm holders get access to land area that is 10 times their holdings, indicating the stress marginal farmers face in the country. Farmers’ capacity to invest in land has decreased due to smaller land holdings at disposal, the Economic Times quoted Prakash Bakshi, former chairman of the National Bank of Agriculture and Rural Development, as saying on August 24, 2013. About 52% of India’s agricultural households are indebted; with an average outstanding loan of Rs 47,000, according to Agricultural Statistics 2016 based on the National Sample Survey Office–Assessment Survey of Agricultural Households (Jan-Dec 2013). The indebtedness varies across states, from 93% in Andhra Pradesh to 2.4% in Meghalaya. Agricultural households with marginal holdings are the most indebted (64%) compared to just 0.6% of households holding large farms. Nearly 70% of India’s 90 million agricultural households spend more than they earn on average each month, pushing them towards debt, IndiaSpend reported on June 27, 2017. About 62.6 million households spending more than they earn had land holdings of one hectare or less. In contrast, 0.39% households owning more than 10 hectares of land had an average monthly income of Rs 41,338 and consumption expenditure of Rs 14,447, thereby maintaining a monthly surplus of Rs 26,941. Among farmers/cultivators, indebtedness was the major cause of suicide (3,097) in 2015, followed by crop failure (1,562), IndiaSpend reported on January 2, 2017. Small (45.2%) and marginal (27.4%) farmers accounted for 72.6% of all farmer suicides in 2015. Based on the land holdings, National Crimes Record Bureau classifies farmers into four categories–marginal (having less than 1 hectare of land), Small (having 1 hectare to below 2 hectare of land), medium (having 2 hectare to below 10 hectare of land) and large (having more than 10 hectare of land). As many as 12,602 farmers and agricultural labourers committed suicides in 2015. Of these 8,007 were farmers/cultivators and 4,595 agricultural labourers. Over 300,000 Indian farmers have committed suicide since 1995, IndiaSpend reported on January 2, 2017. “Farmer suicides would not end unless and until farmers’ debt is not taken up as an individual issue,” said agricultural economist Sardara Singh Johal, quoted in the Indian Express on July 26, 2017. An eye opener. Spot on. Thanks.